This is a sponsored post written by me on behalf of Dickey's Barbecue Pit for IZEA Worldwide. All opinions are 100% mine. Brooklyn’s newest barbecue pit comes straight from the heart of Texas. Travis Dickey, a World War II Veteran opened Dickey's Barbecue Pit in 1941, serving brisket, pit hams and a few drinks. After his sons took over in 1967, Dickey’s expanded quickly across the Dallas-Fort Worth Area. They began franchising in 1994 and now their high- quality smoked meats are sold at more than 500 location in 45 states, including the signature Big Yellow Cup, whose design changes throughout the year. Even though the company has grown, all the meats are still hickory smoked on site to maintain quality and flavor. 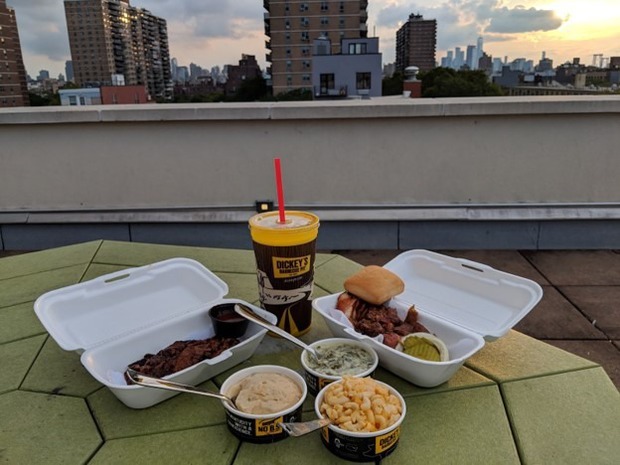 Dickey’s Brooklyn location is near Barclay’s Center, but it’s available for delivery all over Brooklyn via their website and app. If you’re able to visit in person, kids eat free on Sundays and the restaurant offers free ice cream with the meals, a longtime tradition. Both are easy to use and show you photos of the dishes to help narrow down the options. Dickey’s delivers, and quickly. The driver called to confirm our address and the food arrived hot and fresh, except for the nicely chilled Big Yellow Cup of Sweet Tea. The tea was the perfect refreshment for barbecue, it was sweet– but not too sweet. An ideal contrast to the meat. For any first time Dickey’s diner, the pulled pork is a must, as is the signature Texas–style brisket. The pulled pork is juicy and tender, with a lovely smoky flavor. All the meats, especially the smoked chicken and kielbasa, are complemented perfectly by the sweet and tangy barbecue sauce included with each order. 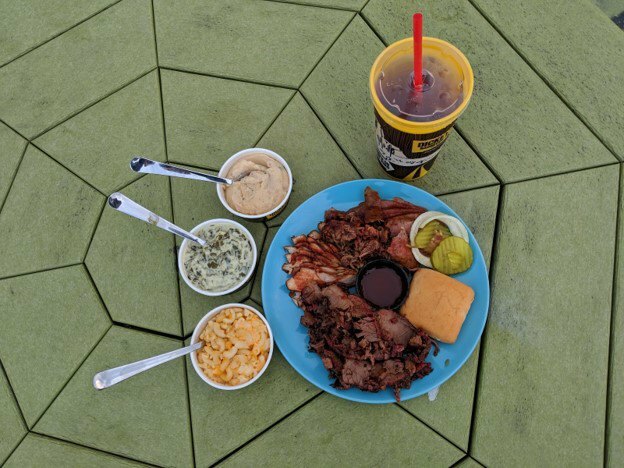 Dickey’s offers one, two and three meat combo plates, and you can select from an extensive array of sides, like jalapeño beans and macaroni and cheese. If you’re taking the meal as a picnic, consider one of the hearty sandwiches, served on brioche buns or rolls. Dickey’s even offers a kid’s menu with a miniature meat plate or slider, offering Brooklyn kids their first taste of Texas barbecue. Many of the sides are vegetarian to satisfy those with dietary restrictions. The mashed potatoes were the crowd favorite and each combo comes with a buttery dinner roll and pickles. 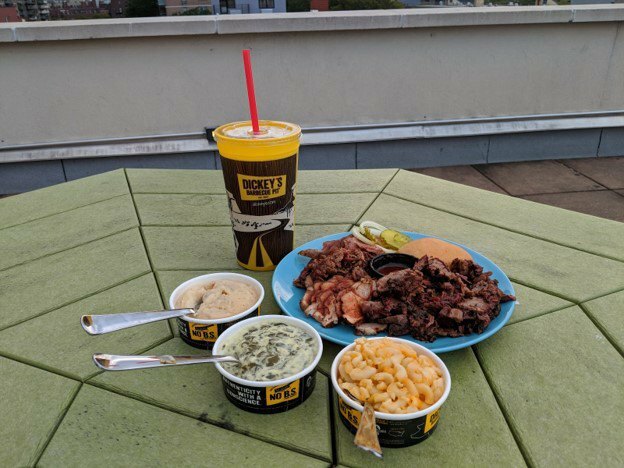 Dickey’s delivery is perfect for dinner with friends; we ate outside on the roof watching the sunset and got the authentic Texas barbecue experience delivered straight to us. Everything is ready for sharing and perfect for last minute hangouts. Place a group order and get ready for an authentic and convenient feast. Dickey’s offers delivery via their website or app. Delivery fees may apply, delivery times may vary and delivery is available in select areas only. For your first order, we recommend the two meat combo of Texas Brisket and Pulled Pork with sides of mashed potatoes and jalapeño beans. Get a Big Yellow Cup of tea and pick up some beers to complete the experience. 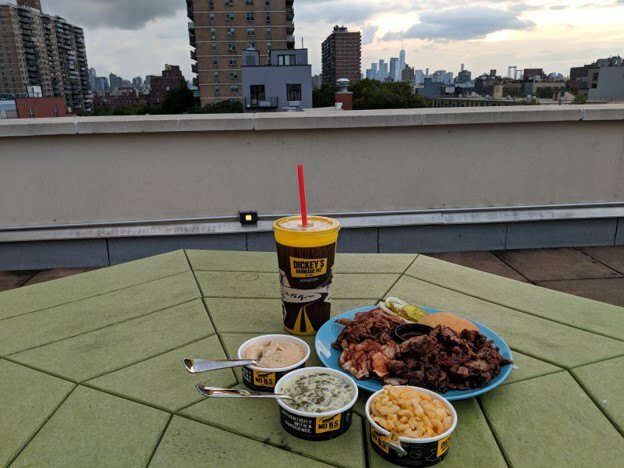 You may be in Brooklyn, but with Dickey’s Delivery, you’ll get Texas smoked flavor brought straight to your door.